ABS-CBN programs dominated the ratings game last Sunday,August 24, when it topped both the daytime and primetime races. 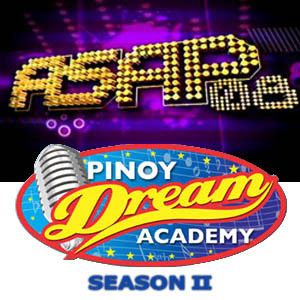 ASAP '08 maintained its No. 1 position in the daytime raceby virtue of its 19.9 percent rating; beating rival SOP, which placed secondwith 16.1 percent. One of the highlights of ASAP '08 last Sunday was its grandpromo forthe movie For The First Time, the first team-up of KC Concepcion and Kapuso topleading man Richard Gutierrez. Over at SOP, Dingdong Dantes and MarianRivera—considered the hottest love team today—also promoted their birthdayconcert at the Araneta Coliseum. Incidentally, the birthday blowout of Dingdongand Marian will happen on the night of the first day of showing of Richard andKC's movie, August 27. In the battle of showbiz talk shows, The Buzz once againprevailed over rival Showbiz Central with a slim margin—12.7 percent versus12.2 percent. In the primetime race, the junior edition of Pinoy DreamAcademy led all shows with 27.8 percent; followed by the return of GMA-7's gameshow Tok! Tok! Tok! Isang Milyon Pasok which generated 26.3 percent rating. Mel & Joey came in third with 26.3 percent while Sharonwas in fourth place with 24.8 percent. Sharon Cuneta's guests last Sunday weredaughter KC, Richard Gutierrez and his mom Annabelle Rama. Completing the Top 10 were Kap's Amazing Stories, Goin'Bulilit, Rated K, All Star K, TV Patrol World, and Ful Haus. Eat Bulaga! and Bitoy's Funniest Videos were thetop winners last Saturday, August 23. Consistent Saturday-daytime top-rater Eat Bulaga! got 23.3percent; followed by Pinoy Records (18.6 percent), Wish Ko Lang (18 percent),Startalk (17.3 percent), and Wowowee (17.2 percent) to complete the Top 5. Bitoy's Funniest Videos reclaimed its No. 1 position bygarnering 30.1 percent rating with Kapuso Mo, Jessica Soho a close secondwith 29.6 percent. Pinoy Dream Academy was in third place with 26.7 percentwhile Imbestigador came in fourth with 25.6 percent. The second season ofCelebrity Duets debuted at No. 5 with 24.8 percent. Although Dyesebel still rules the weekday primetime race,Ako Si Kim Samsoon is showing remarkable improvement in the ratings game. TheRegine Velasquez-Mark Anthony Fernandez starrer ranked second for the firsttime last Friday, August 22, with 31.1 percent, behind Dyesebel's 39.6 percent.Ako Si Kim Samsoon overtook Richard Gutierrez's Codename: Asero, which had beenconsistently ranking second since its pilot episode until this point. Regine's romantic-comedy serieshad been placing third and fourth the previous days. Codename: Asero dropped to third place with 30.8 percent;followed by 24 Oras (27.3 percent), The Singing Bee (26.4 percent), Dyosa (25.3percent), the final episode of Dalja's Spring (23.3 percent), My Girl (23.2percent), Iisa Pa Lamang (22.7 percent), and Pinoy Dream Academy (20.7 percent)to complete the Top 10. Magdusa Ka, on the other hand, lorded it over all daytimeshows with its 21.7 percent rating. The said GMA-7 Sine Novela also topped thedaytime race last Wednesday and Thursday. Yesterday, August 25, Magdusa Ka and Dyesebel also topped the daytime and primetime races, respectively. Interestingly, the ratings of almost all ABS-CBN primetime shows went up, although GMA-7 programs Dyesebel, Codename: Asero, and 24 Oras still ranked higher. The Singing Bee zoomed to fourth place with 28.7 percent; followed by Dyosa with 27 percent, Iisa Pa Lamang with 26 percent. GMA-7's Ako Si Kim Samsoon dropped considerably to seventh place with 25.6 percent. Click here for the ranking of the daytime andprimetime programs from August 20 to 25.